Poland has buried the liberal mayor of Gdansk, Pawel Adamowicz, amid questions as to what extent Polish hate politics contributed to his killing. 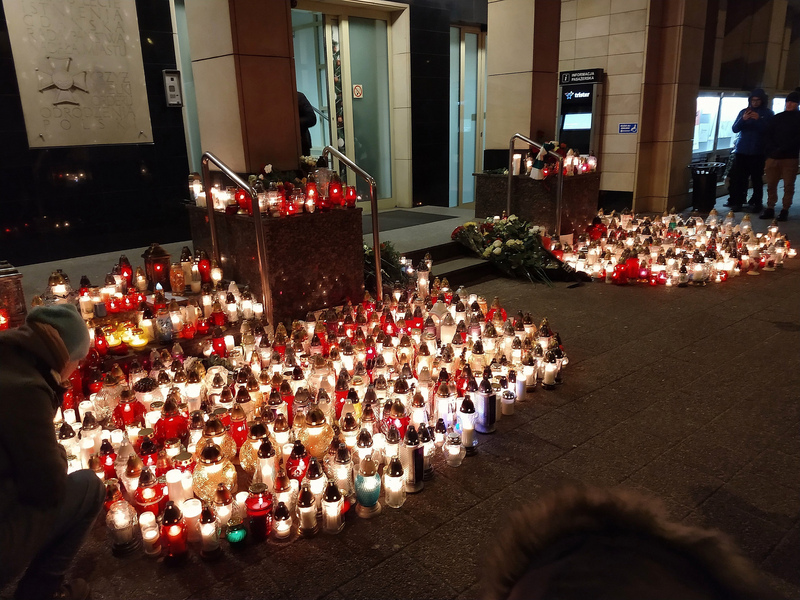 The funeral took place at the Bazylika Mariacka in Gdansk on Saturday (19 January) - declared a national day of mourning after he was stabbed to death at a charity gala one week ago. 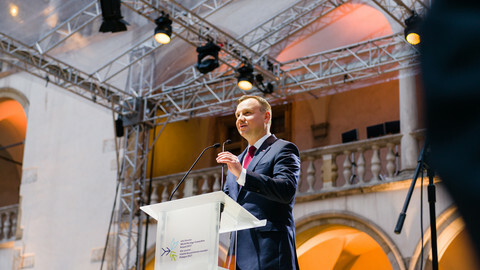 Family and friends aside, it was attended by the president of the EU Council, Donald Tusk, Polish president Andrzej Duda, and Polish prime minister Mateusz Morawiecki, as well as opposition party leaders and former VIPs. According to Gdansk city council, more than 50,000 people had also come to pay their respects over the past few days, when Adamowicz's body was on show at the European Centre of Solidarity - a museum, which he had created, to Poland's anti-communist movement. Adamowicz entered politics in the 1980s as an anti-communist protester and had held his Gdansk seat since 1998. He had been a member of the conservative Civic Platform party from 2001 to 2015, but became more liberal after leaving its ranks, when he began to advocate LGBTI rights. An outspoken critic of the ruling, right-wing Law and Justice (PiS) party, he had been the victim of a vicious hate campaign on PiS-controlled media prior to his murder. Repeatedly dubbed a "German stooge" ["volksdeutsche"], a "homo-propagator", and a "thief", he had said he "didn't feel safe in public" any more. "Pawel was killed by hatred," Aleksander Hall, a Polish former anti-communist activist said at the funeral on Saturday. "That hatred was incited and fuelled by those who discredited him ... mainly the so called 'public media'," he added. Piotr Adamowicz, the late mayor's brother, recalled that the All Polish Youth, an ultra-nationalist group, had put the deceased's name on a fake death certificate in 2017 due to his "liberalism, multiculturalism and stupidity". 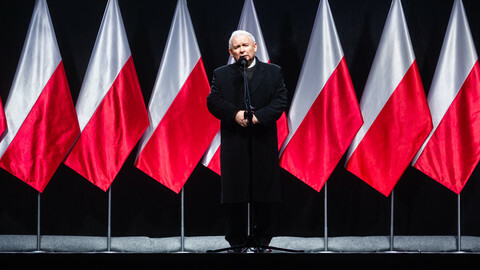 Poland must "stop the hatred, hateful language, contempt and groundless accusations", Ludwik Wisniewski, a Dominican cleric who spoke at the funeral, said. But the funeral itself became a venue for more of the same despite the fine words. Wisniewski also said that "a person who builds their political career on lies should not hold a high-level post in our country". 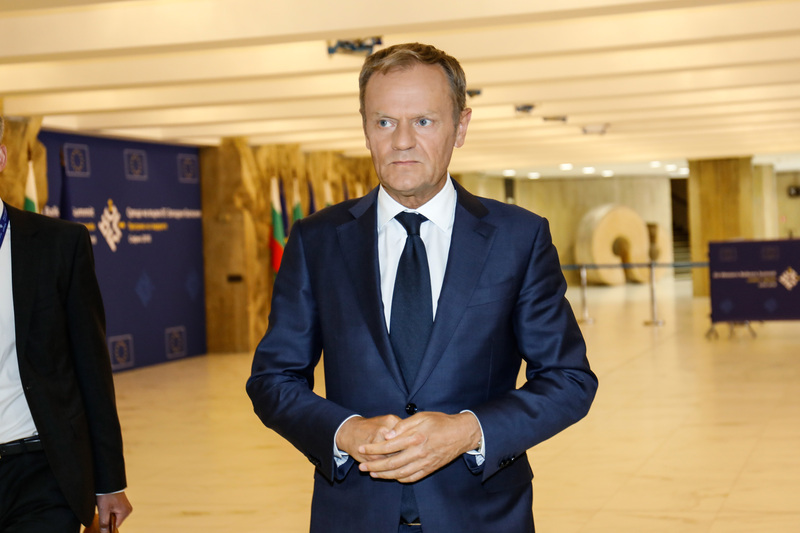 TVP, the PiS-controlled national broadcaster, illustrated the remarks by showing a long shot of Tusk, the former Civic Platform leader, and a PiS adversary. But for Grzegorz Schetyna, the current Civic Platform head, Wisniewski's comments was really directed at PiS - "for those who caused this whole situation". Andrzej Krajewski, the former head of the National Broadcasting Council (KRRiT) agreed. 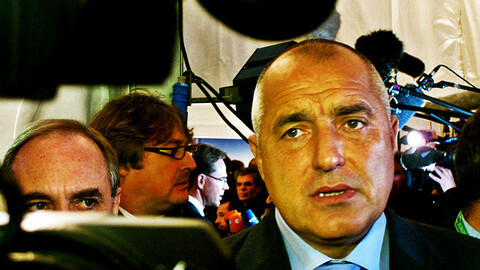 The way TVP framed Tusk was "an absolute failure of journalistic standards", he said. "There are no ethical boundaries that haven't yet been crossed by PiS-controlled public media", he told EUobserver. But those accusations were "groundless", Jaroslaw Olechowski, a TV producer responsible for the TVP content, said on Twitter. The prosecutor's office is still investigating the motives of the killing which took place last Sunday at a charity gala, which had also taken flak in PiS media. Seconds after the stabbing, the attacker, Stefan W., claimed he did it for political reasons, because he had been "tortured" by Civic Platform. It later emerged he has a history of mental illness and violent crime, including four armed robberies. The All Polish Youth group denied any responsibility calling him a "regular criminal" who "had a history of violent assaults and robberies". The government also responded with a crackdown. Zbigniew Ziobro, the justice minister, said he would change the penal code to make sure people like Stefan W. did not slip through the net. Police also arrested 20 people who made online death threats against other mayors or who glorified Adamowicz's killing. But the government reaction was closing the stable door after the horse had bolted, Rafal Pankowski, an expert on radicalisation at Collegium Civitas, a university in Warsaw, told this website. Authorities had declined to prosecute a string of hate crimes in recent years, causing the current climate, he said. 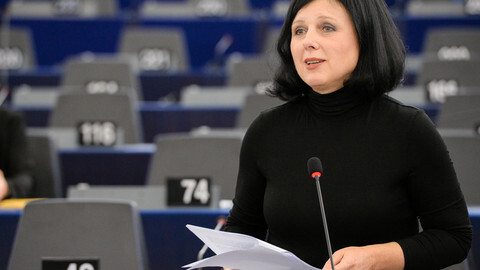 He listed the public burning of the effigy of a jew in 2015, physical assaults on women during a national day march in 2017, and the recent hanging of portraits of liberal MEPs on gallows in the city of Katowice as examples. 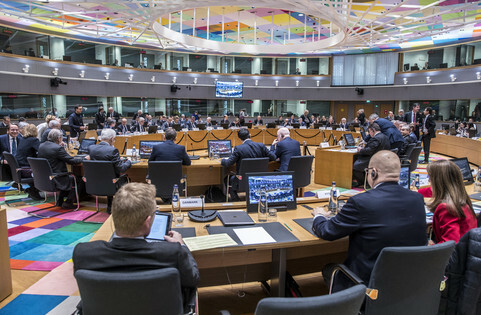 "Such passiveness of the state institutions legitimises violence and creates a fertile ground for individuals who may feel attracted to committing such crimes", Pankowski said. Adamowicz's killing was an "extremist incident", despite his killer's mental health problems, he said. "These offences are usually committed by individuals who are not necessarily associated with certain radical groups, but who are motivated by their rhetoric," he added. Recent research indicated that 14 percent of Poles felt that "political violence" was acceptable "it was necessary to achieve important goals", the academic noted, in a worrying trend. 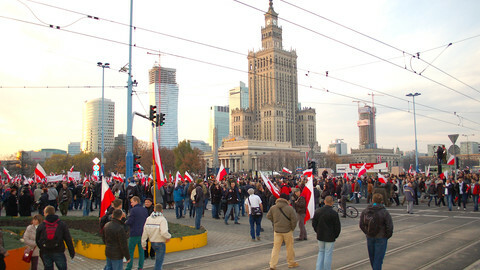 The TVP-Tusk controversy indicated that little would change on the Polish political scene despite the Adamowicz tragedy. But the question remains to what extent the murder would influence the upcoming European elections in May and the Polish parliamentary vote in autumn. 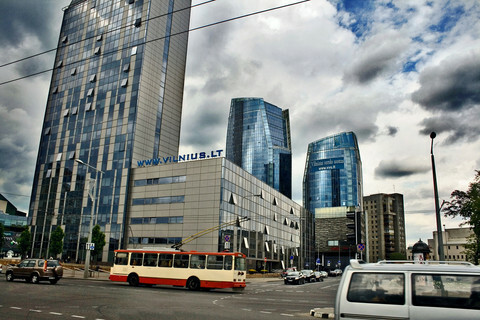 The first polls conducted after the killing by Kantar Millward Brown showed that support for PiS was at 30 percent, its lowest level since it got into power in 2015. At the same time, support for Civic Platform rose to 25 percent. But according to a later poll by CBOS on 18 January, PiS and Civic Platform both lost two percent support and PiS remained 17 points ahead. "It takes more than a week for such a tragic event to shape public opinion," Jaroslaw Flis, a politics teacher at the Jagiellonian University in Krakow, Poland, told this website. 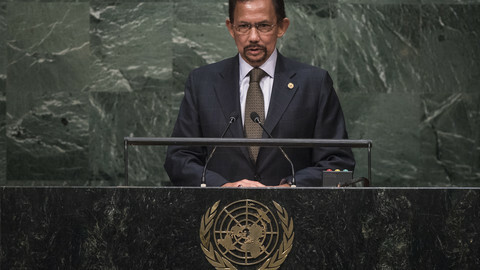 "It all depends on how this topic will be addressed by the main political figures - whether they will shift or strengthen the existing narratives," he said. But no matter who wins the upcoming votes, the tragedy was likely to see a greater interest in the political process in the country, he added. "Most importantly, such dramatic events usually result in the mobilisation of the electorate and a higher turnout," Flis said.